EL Direct Rendering Manager et componentes in user space. Direct Rendering Infrastructure versus "indirect rendering": el X server es root porque él continua 2D driver. Solo el Direct Rendering Manager accesos la GPU. 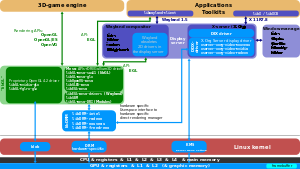 In Linux kernel 3.12 render nodes were merged into the DRM. The KMS was split of. Wayland implementa "direct rendering" para EGL. Esta página se editó por última vez el 13 abr 2015 a las 17:41.